The Ballon d’Or – the most high-profile individual award in men’s football – will be handed out in Paris at the start of December. So far, so traditional. 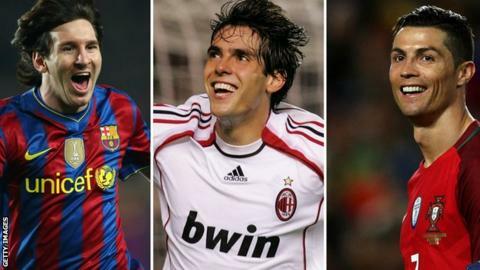 However, this year there is a real chance that for the first time since 2007 the recipient will be neither Barcelona’s Lionel Messi nor Juventus’ Cristiano Ronaldo. Ronaldo’s former Real Madrid team-mate Luka Modric was named best player at the Best Fifa Football Awards awards in September and is a contender, while Real’s Wales forward Gareth Bale and Tottenham’s England striker Harry Kane are among the 30 nominees for this year’s prize. So, if we assume Argentina’s Messi and Ronaldo of Portugal are the undisputed top two, who is the third best player in the world? We asked some of our BBC Sport pundits for their thoughts and had a look through the stats to try to find out. See what they think – then vote at the bottom of the page. “This is a difficult one because a lot of the contenders are very close. Kevin de Bruyne was excellent for Manchester City last season, but one year is too short a timescale to judge a player – and consistency is what I am looking for. “Eden Hazard has been at this level for a few seasons now, so he is up there – but Neymar has been consistently brilliant for a number of seasons now, scoring lots of goals. Did you know? Neymar has missed as many matches for PSG in 2018 as he has played (21). The club have won 19 of the 21 he has played, but only 14 of those he has missed. “Kylian Mbappe had an incredible World Cup for France in Russia and he would be in my top five in the world, but it is Eden Hazard at the moment, based on the way he has started this season and carried his form on from Russia. Best in the Premier League right now? “Eden Hazard is up there with the very best, and so is Barcelona’s Luis Suarez, but I am going for Luka Modric. “He has just had an unbelievable season for Real Madrid after a number of other unbelievable seasons, and capped it off with an absolutely brilliant World Cup, when he guided Croatia all the way to the final. “Modric can run the game from midfield against any opposition, but he is not just a playmaker because he can nick the ball off you too. “Luka Modric has had a year to remember and I love watching Antoine Griezmann, who just seems to get better and better. On current form, Eden Hazard comes into it too because he has been sensational. “But I am not going to go on form, I am going to go on ability, what they have done at club and international level and where I think they are going to go. “I am going to go with Neymar. At Paris St-Germain he is probably playing within himself because I think Ligue 1 is just so easy for him, but at Barcelona he was exceptional, as part of ‘MSN’ with Lionel Messi and Luis Suarez. “He is only 26 but already has 30 Champions League goals, one behind Rivaldo who is Brazil’s record goalscorer in the competition, and he has already done so much at international level too. “I know Neymar did not have a great World Cup, but that is not the be all and end all for the way I decided this. “A great World Cup can take a player’s reputation to the next level – but you could argue that we are still waiting for Lionel Messi to have that kind of spectacular tournament himself. “It may not be fashionable to mention a defender when you have a conversation like this, but when you look at the difference Virgil van Dijk has made to Liverpool then you can see just how good he is. “There is not an attribute you need as a defender that he does not have – he is quick, strong, consistent and he does not seem to lose his concentration. “He also has tremendous distribution when he is on the ball, and he reads the game so well. He has got the lot. “Are we talking about the third best player right now? Or are we asking who is the pretender to the throne? Because it is a different answer. “Eden Hazard was not in the running last season. If I had been asked then, I would have said Liverpool’s Mohamed Salah was better, and also that Kevin de Bruyne at Manchester City was as good as any of the other contenders as well. “But if we are talking now, and form this season, then Hazard is very close, if not the third best player right now. “Giving someone that mantle because he has had a good start to the season is pushing it a wee bit though. “If you are asking me to consider who is the player that is going to be the next great, after Messi and Ronaldo – which is a different question – then I would say that is Kylian Mbappe. “Mbappe is the next big thing – and he will be the next to take up the mantle of being the ‘best in the world’ – but I would not say he is the third best right now based on what he has done this season. “At the moment, Hazard is playing as well as anyone else in the world but that is very short term. 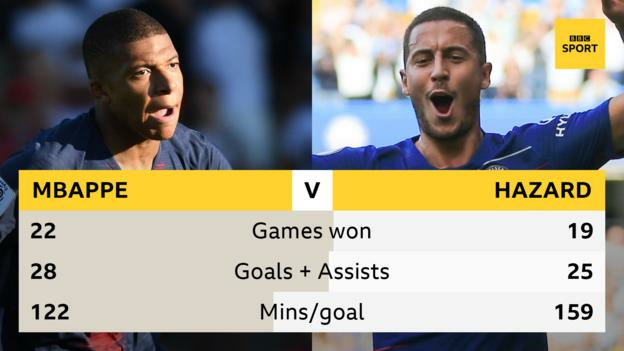 “How do you compare Hazard and Mbappe to the brilliance of Raphael Varane at centre-back for Real Madrid and France? Defenders never seem to get the same accolades – the last time a defender won the Ballon d’Or was Fabio Cannavaro in 2006.